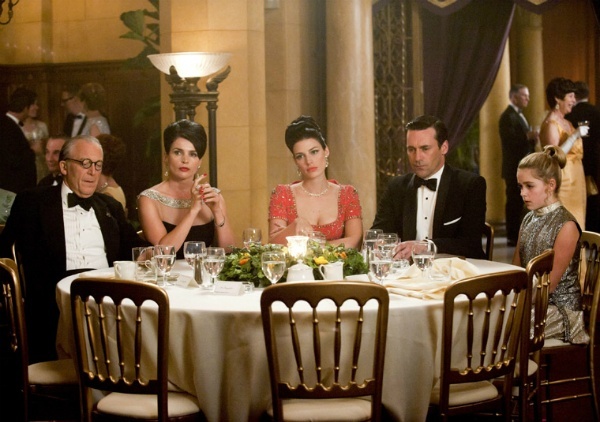 COOL: Mad Men S5 E7 “At the Codfish Ball” aka. Something to Sink our Teeth Into | Everything is cool. Oh, I really loved this episode. Yay! Why? I think I figured it out: because instead of having a Theme and Things With Meaning, it had a lot of characters, interacting with a lot of other characters, and all of these interactions intersected and overlapped in ways that weren’t so easy to map. Reading some post-episode reviews / recaps, I saw several attempts to expose The Theme: this episode was about fathers and daughters, for example. And at first I slapped my forehead and said, of course! But then I realized how much more was in it and recognized that any attempt to say “this episode was about ______” was reductive, and then I understood why it was such a good episode. Sure, there’s stuff going on in this episode with fathers and daughters, but it wasn’t at all what stood out me about the episode. Rather, I was struck most by two issues: how women interact with one another (of course), and the fact that Mad Men, which has explored anti-capitalist ideologies mainly through the idealism of young people, here allowed it in through a figure of age, experience and wisdom (though not a romanticized one). I’ll discuss each of these issues a bit, and then allow you to agree, disagree, or fill in all the inevitable gaps in this post. 2. Long live the revolution! As an academic, I am instantly sympathetic with Megan’s dad, though he was portrayed as a very flawed man, no doubt. I originally read Megan’s discomfort with Peggy’s congratulations as her knowing that she doesn’t deserve the same kind of accolades as Peggy did, having attained the boss’s ear in a somewhat more compromised way. But Megan’s father’s comments to her at the end of the episode helped put her disappointment in another context. When Peggy says, “this is as good as it gets,” could Megan help but think how far this pinacle of advertising success is from her real dreams of being an actress and artist? We’ve had previous discussions about how Megan has more depth as a character than we may have expected, while at the same time she continues to play a “Betty role,” supporting character to Don’s lead performance. This episode confirmed both sides of that hypothesis; Megan is less sympathetic than Peggy or Joan because she did take a shortcut to success, she did skip the struggle. At the same time, we’re made aware that she is, herself, aware of that fact, and not necessarily comfortable with it. As the bubble of advertising where closing the deal is “as good as it gets” is put in perspective in this episode, Don is caught between this creative idealism and the absolute tyranny of market logic. He’s told point blank that his one “idealistic” move (which of course, he knows all too well, was entirely pragmatic) has cost him the trust of the entire business community; he’s seen as a traitor who puts his ethics (god forbid!) above the bottom-line needs of the client. I think this assessment of Don’s place in advertising has finally set up our season arc. What can or will Don do about this? Will he have to leave advertising for a profession outside of the business world? (Teaching comes to mind.) Or will he make some devious move to show he’s all shark and no heart? I sense exciting possibilities, as long as Don and Megan don’t retreat to an artist colony and become hippies. As much as I’m intrigued by Don’s and Megan’s respective journeys, I definitely do not think they should be taken together. These two are so essentially disconnected it hurts to watch them on screen together.